Unlevel, discolored and cracked concrete erodes a home’s beauty and eats away at property values. In such a wealthy suburb as Danville, California, the effects can be devastating. If you see weeds popping out of your driveway, if your walkways start to crumble after a wet winter or if your floors have been damaged by too many years of foot traffic, now is the time to repair, refinish and restore. Sierra Concrete Resurfacing operates the region’s leading decorative concrete business. Skilled designers take the time to understand your issues and goals, while reputable installation crews bring your dreams to life. A few men and women may do the heavy lifting, but you remain in control of your property and your budget. Throughout Oakland and San Francisco, happy customers continue to refer their friends and neighbors to this local team of reliable craftsmen. The experts at Sierra Concrete Resurfacing have repaired and resurfaced concrete in the San Ramon Valley for more than 30 years. They have earned an A+ ranking from the Better Business Bureau for continued excellence in the areas shown below. If you would like advice on your residential or commercial project, call 916-631-9666 for a free consultation. Concrete staining brings out the natural splendor of concrete bathrooms, kitchens, rec rooms, patios and pool decks. Acid stains and water-based stains form a unique image that no one else in Contra Costa County will have. Choose from a range of sophisticated colors and patterns, such as rich brown leather or Sycamore Creek green. Technicians seal your dye selection to ensure durability and low maintenance. Stamped overlays produce high-end surfaces on any budget. Crews apply special molds and pigments to your existing concrete, thereby creating the look of natural stone, wood or other materials. In the Town of Danville, the Tuscan, Old World and limestone stamps are popular, but you can opt for any number of designs. 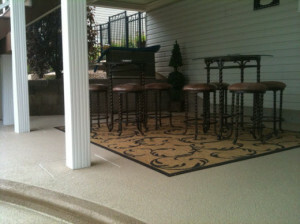 Stamped concrete overlays look amazing on driveways, walkways, entryways and backyard sitting areas. Outdoor resurfacing revives patios and pool decks that have been destroyed by winter rain and summer heat. The concrete contractor sprays an acrylic cement coating, such as Sundek Classic Texture, to cover blemishes, reduce slipperiness and add years of life. Whether you live near the Las Trampas Open Space in western Danville or near the rolling hills of Magee Ranch to the east, you need attractive concrete to make your time outside more enjoyable. Polyurea polyaspartic and epoxy floors are the professional’s choice for high-traffic areas like garages, hospitals and retail stores. Crews repair and level your current concrete and then apply a decorative chip coating for extended durability. The new surface cleans easily and requires little upkeep. You will appreciate these benefits even more after a muddy hike down Mount Diablo or a dusty horseback ride across the Iron Horse Trail. In the end, the only way to maintain the charm of Danville is to maintain its properties. When you notice cracks, chips or stains, contact a professional concrete contractor right away. Whether your job is large or small, Sierra Concrete Resurfacing can perform your renovation quickly and affordably. Call 916-631-9666 for decorative concrete design ideas and a no-obligation estimate.